Here are many topics and duties you are dealing with every day: find the perfect location, analyse the commercial offer, search for retailers for a vacant location identify and characterise competition, compile presentation reports, import data into your GIS, etc. The pace of business forces you to find accurate information very quickly. The online service Codata Explorer gives you with all answers in a few clicks. What answers with Codata Explorer? 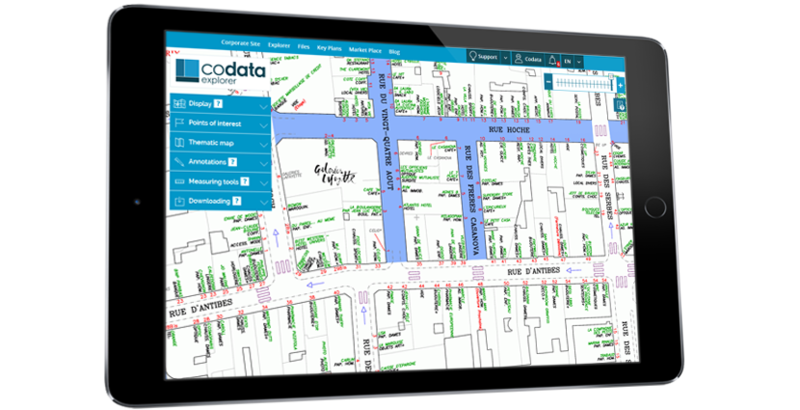 Codata Explorer is designed for commercial real estate and retail professionals that are continuously searching for relevant information in the commercial real estate sector. Codata database is accessible via an ergonomic and efficient interface. With Codata Explorer, your answers won't remain unanswered. Unlimited search possibilities in a database on 700,000 Locations, 7,700 Sites, 1,000 commercial Projects and 25,000 contacts in 10 European countries. 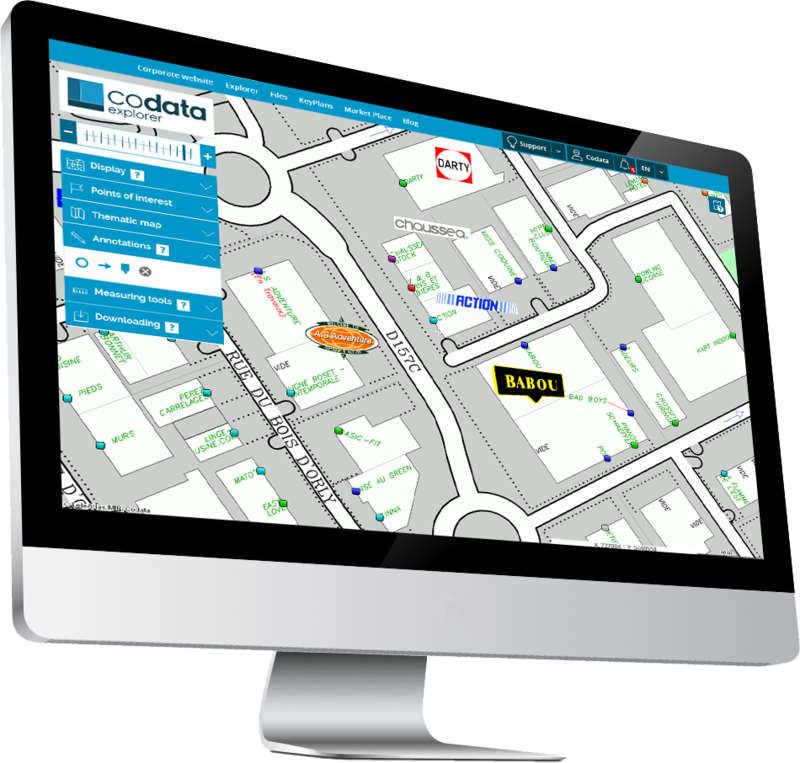 With Codata Explorer, the commercial real estate professional has constant access to the wealth of the biggest commercial real estate database in Europe. At the office, at home or while travelling, Codata search tools and data are available 24/7 with a service rate of 99.9%. For 20 years, our teams have been ensuring accurate, dated and georeferenced data. Have access to a simplified mobile version if you use a smartphone or a tablet. The application Codata Mobile is available on AppStore and Androïd. It has been specifically designed for a nomadic access to some elements of the database Codata Explorer. Codata Explorer offers you the necessary flexibility to work wherever you wish 24/7. Codata Explorer is an accessible solution that doesn't require any specific program or software. You only need a simple web browser. Your researches vary depending on your needs. You may search for a precise commercial Site or Location, or for a set of Sites, Locations or Projects corresponding to one or several criteria. For more than ten years, Codata has been optimising its search engines with the commercial real estate professionals. They are designed to answer quickly and easily to simple or complex issues. 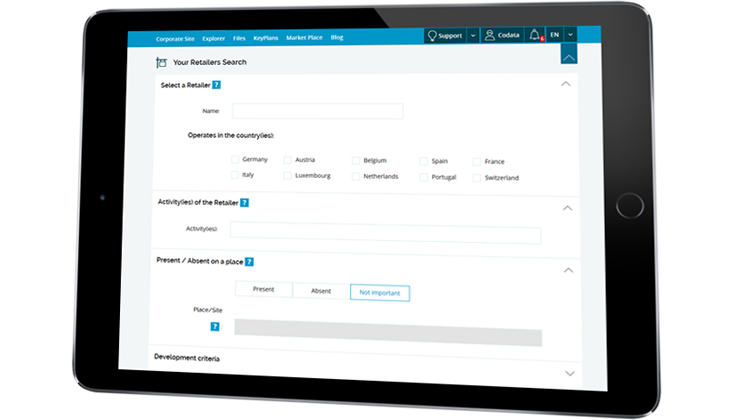 Codata Explorer search engines have been designed to answer as many questions as possible and to provide fast and appropriate answers. Your business requires you to search for contacts every day. You may look for a precise company or a contact or a set of operators corresponding to various criteria. The presence or absence of Retailers on the selected Site(s). Codata Explorer search engines give you access to 25,000 contacts in the various sectors of the commercial real estate in ten European countries. Most search results can be displayed on a dynamic cartographic interface. Locations, Sites and Projects are georeferenced and represented at the level of the cadastral parcel map. Download map extracts in the most appropriate format. Codata Explorer cartographic interface combines the strength of Codata data with the flexibility of a dynamic interface. This enables you to fashion the maps according to your wishes, then to download them in PDF format. Codata has developed a specific version of its tool Explorer for its clients on the field. 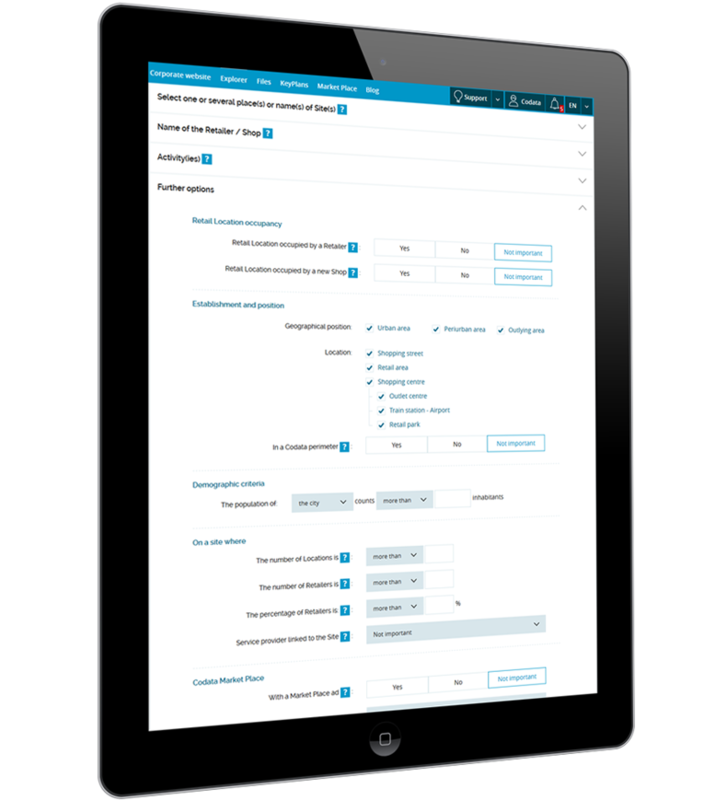 Consulting of the section "My subscription"
Codata Mobile is the condensed version of Explorer, available while travelling in an adapted format for most devices on the market. Click on one of the links to get directly to Codata Mobile, the solution conceived to assist you while you are travelling. 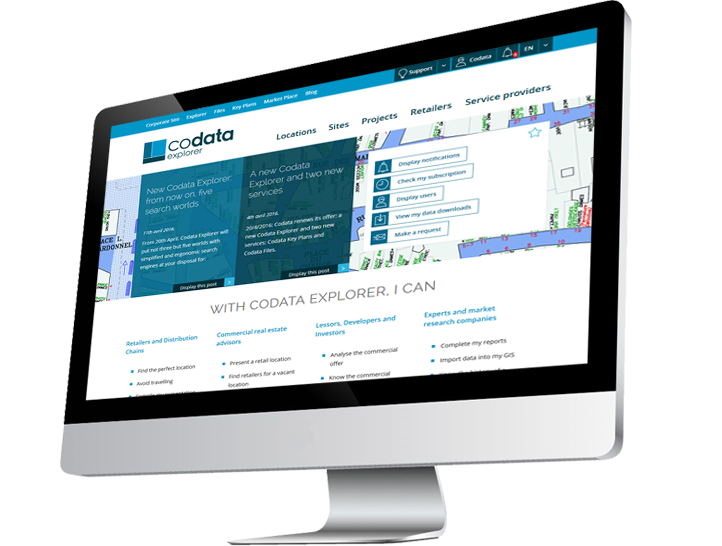 Codata Explorer is available on subscription with the possibility to consult and download online 24/7.